Bruce A Peterson American Pilot Test Pilot. Born 23 May 1933. Personal: Male. Born in Washburn, North Dakota, USA. Astronaut Group: Test Pilot (NASA) Status: Inactive. Entered space service: 1960. Left space service: 1967. 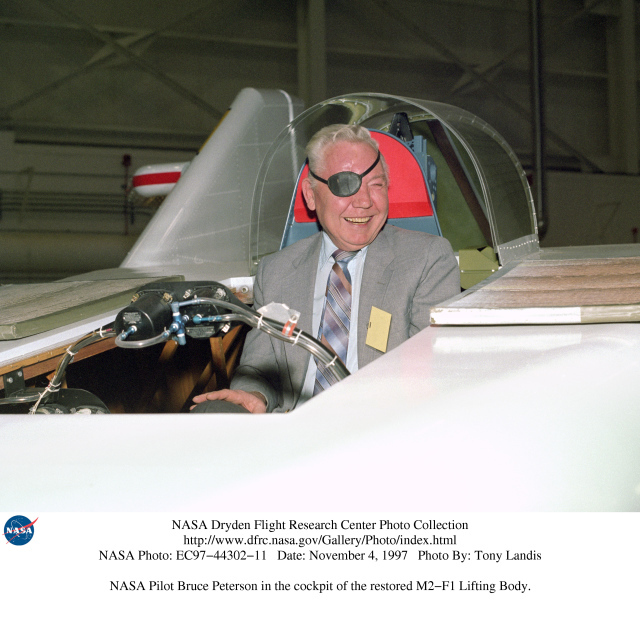 Bruce Peterson was NASA Dryden research pilot from the early 1960s until 1967. A former US Marine Corps pilot, he joined NASA in 1960 as an aeronautical engineer. He was one of the project pilots on the Rogallo paraglider research vehicle (Parasev) program. The Parasev 1-A and 1-B evaluated the use of an inflatable, flexible wing for the recovery of manned space vehicles, with over 100 research flights made between 1962 and 1964. On December 3, 1963 he flew the M2-F1 Lifting Body, his first of 15 flights in these wingless research vehicles. He flew the M2-F1 ten times, and made the first flight of the HL-10 on December 22, 1966. Peterson retired from research flying after his fourth flight in the M2-F2. 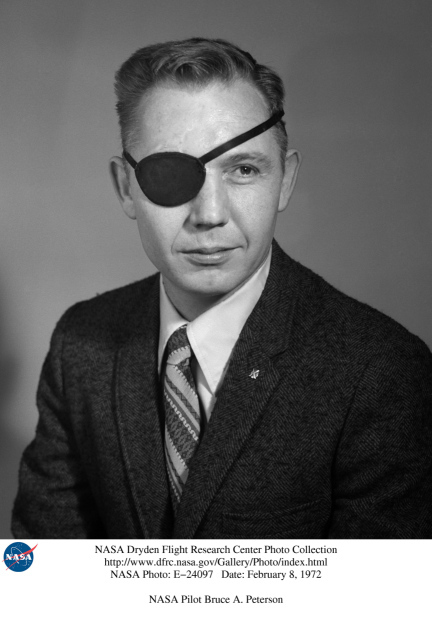 He lost his sight in one eye as a result of a landing accident in the aircraft on May 10, 1967. Peterson continued at NASA Dryden as the Research Project Engineer on the Digital Fly-By-Wire program of the late 1960s and early 1970s, and later assumed responsibility for Safety and Quality Assurance for Dryden. Upon leaving NASA he became the safety officer for the Northrup B-2 Bomber flight tests. A native of Washburn, North Dakota, Peterson was born on May 23, 1933. He attended the University of California at Los Angeles, and California State Polytechnic College at San Luis Obispo. Peterson received his Bachelor of Science degree in Aeronautical Engineering from the latter in 1960. He is a member of the Society of Experimental Test Pilots. 16 September 1966 - M2 Flight 6 Assignment: Prime Crew. 360 degree approach. Maximum Speed - 750 kph. Maximum Altitude - 13720 m. Flight Time - 210 sec. 22 September 1966 - M2 Flight 8 Assignment: Prime Crew. Maximum Speed - 702 kph. Maximum Altitude - 13720 m. Flight Time - 233 sec. 22 December 1966 - HL-10 Flight 1 Assignment: Prime Crew. First flight HL-10. Maximum Speed - 735 kph. Maximum Altitude - 13720 m. Flight Time - 187 sec. 10 May 1967 - M2 Flight 16 Assignment: Prime Crew. Landing accident. Maximum Speed - 648 kph. Maximum Altitude - 13720 m. Flight Time - 223 sec. Bruce A. Peterson joined NASA in August 1960 as an engineer at the Flight Research Center (now NASA Dryden Flight Research Center). He transferred to Flight Operations in March 1962 and was initially assigned as one of the project pilots on the Rogallo paraglider research vehicle (Paresev) program. The Paresev was used to evaluate the use of an inflatable and non-inflatable, flexible wing for the recovery of manned space vehicles. A handful of NASA pilots made more than 100 Paresev research flights between 1962 and 1964. It resembled a tricycle beneath a hang glider, and was towed aloft behind a car or small airplane and released for a glide landing. In preparation for his continued flight research duties, he attended the Air Force Test Pilot School, graduating as a member of Class 62C. In fact, he was the first NASA pilot to graduate from the TPS. He remained active with the Marine Corps Air Reserve, flying the F9F, OV-10, A-4 and various helicopters. As a NASA research pilot he flew a wide variety of airplanes including F5D-1, F-100, F-104, F-111A, B-52, NT-33A Variable Stability Trainer, T-33, T-37B, T-38A, C-47, CV-990, Learjet, JetStar, wingless lifting bodies, numerous general aviation aircraft, several types of helicopter and sailplanes. As project pilot on the F-111A, he performed tests related to stability and control, performance and structural loads. The F-111 was a variable-geometry (or swing-wing) jet aircraft. Research with the aircraft included engine inlet and exhaust studies, internal flow investigations and aerodynamics research. On Dec. 3, 1963, he flew the first of 42 flights in the M2-F1 lightweight lifting body. His first flight in the heavyweight M2-F2 on Sept. 16, 1966, was an unpowered glide flight from an altitude of 45,000 feet. After release from a B-52 mothership, he executed a 360-degree turning approach and landed on the dry lakebed. He made another glide flight in the same vehicle six days later. Peterson piloted the maiden flight of the HL-10 lifting body on Dec. 22, 1966. During the three-minute descent to landing, he discovered he had minimal lateral control over the vehicle. Airflow separation across the control surfaces rendered the HL-10 virtually unflyable but he managed to land the vehicle safely, a tribute to his considerable piloting skills. As a result of the data collected during the near disastrous flight, the HL-10 was modified to fix the problem and went on to become one of the most successful lifting body concepts. It was a strong contender for the final space shuttle design. 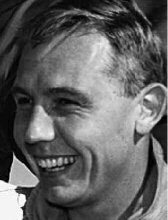 Peterson was seriously injured in the crash of the M2-F2 on May 10, 1967. Although he recovered from his injuries, he lost his sight in one eye due to a secondary infection while in the hospital. 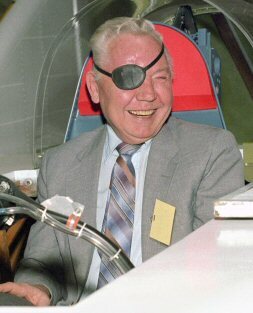 Peterson continued to fly NASA support missions, occasional research flights and continued his Marine Reserve flying duties. He continued to fly for NASA until 1971, doing research in the T-33, F-104B, F-111A, CV-990 and Aero Commander. He also flew NASA's SH-3A helicopter. The Marine Corps gave him a waiver that allowed him to fly with a co-pilot and he continued to fly the OV-10 airplane and the AH-1G and CH-46 helicopters. During his flying career Peterson logged more than 6,000 flight hours in nearly 70 types of aircraft. 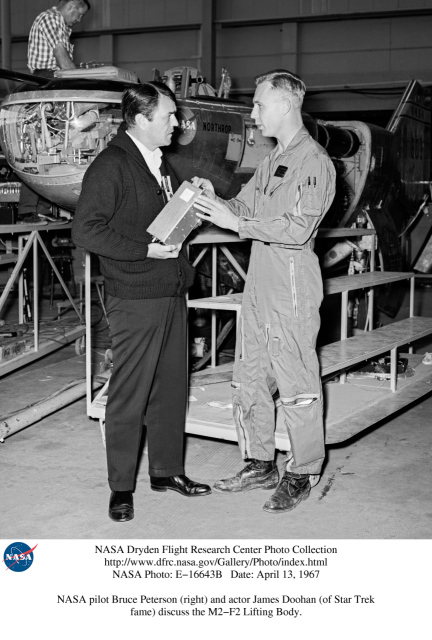 Peterson continued at NASA Dryden as the research project engineer on the F-8 Digital Fly-By-Wire program of the late 1960s and early 1970s, and later assumed responsibility for Safety and Quality Assurance for Dryden until his retirement from NASA in 1981. 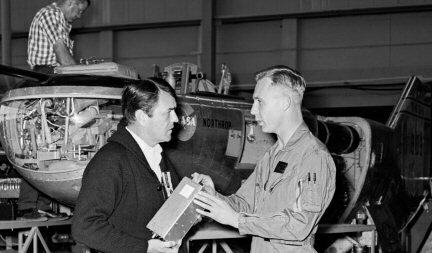 He then joined Northrop Corporation where he assumed responsibility for safety and quality assurance for testing of the B-2 Advanced Technology Bomber. From 1982 until 1994 Peterson worked in Northrop's B-2 division at Air Force Plant 42 in Palmdale and Edwards, becoming manager of system safety and human factors. A native of Washburn, N.D., Peterson was born on May 23, 1933. He Grew up in Banning, Calif., and attended the University of California at Los Angeles from 1950 to 1953. While at UCLA he held a job as an aircraft assembler for Douglas Aircraft Company. He enlisted as a Naval Aviation Cadet at Santa Ana, Calif., in 1953, and was commissioned a Marine Corps second lieutenant in Nov. 1954. He was released from active duty three years later. In 1958 he enrolled in California State Polytechnic College at San Luis Obispo where he received a bachelor of science degree in aeronautical engineering. Peterson was a fellow of the Society of Experimental Test Pilots and 2002 recipient of the Tony LeVier Flight Safety Award. NASA honored him with an exceptional leadership award for his work on the first space shuttle mission, STS-1. In 2003 he was inducted into the Lancaster Aerospace Walk of Honor.